Los Angeles-area physician Manuel Figueroa, MD, has filed a putative class-action lawsuit against Molina Healthcare, claiming the Long Beach, Calif.-based insurer owes him money for Medicaid services he provided between Jan. 1, 2013, and Dec. 31, 2014. 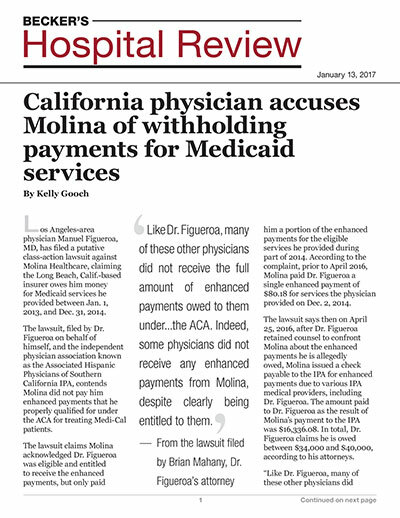 The lawsuit, filed by Dr. Figueroa on behalf of himself, and the independent physician association known as the Associated Hispanic Physicians of Southern California IPA, contends Molina did not pay him enhanced payments that he properly qualified for under the ACA for treating Medi-Cal patients. The lawsuit claims Molina acknowledged Dr. Figueroa was eligible and entitled to receive the enhanced payments, but only paid him a portion of the enhanced payments for the eligible services he provided during part of 2014. According to the complaint, prior to April 2016, Molina paid Dr. Figueroa a single enhanced payment of $80.18 for services the physician provided on Dec. 2, 2014. The lawsuit says then on April 25, 2016, after Dr. Figueroa retained counsel to confront Molina about the enhanced payments he is allegedly owed, Molina issued a check payable to the IPA for enhanced payments due to various IPA medical providers, including Dr. Figueroa. The amount paid to Dr. Figueroa as the result of Molina's payment to the IPA was $16,336.08. In total, Dr. Figueroa claims he is owed between $34,000 and $40,000, according to his attorneys. "Like Dr. Figueroa, many of these other physicians did not receive the full amount of enhanced payments owed to them under...the ACA. Indeed, some physicians did not receive any enhanced payments from Molina, despite clearly being entitled to them," the lawsuit reads. Dr. Figueroa seeks class-action status for the lawsuit, claiming that in addition to his IPA, there are "hundreds or thousands" of other California medical providers who did not receive the enhanced payments they were entitled to receive from Molina. Molina denies the allegations in the lawsuit and said it will defend itself in the case. "In regards to the ACA Section 1202 on increased payment for Medicaid providers, from the beginning, we have strongly supported eligible providers in our network in registering with the state and submitting claims to receive the increase in payment for specific services rendered," the insurer said in a statement. "Our company was initially founded 37 years ago by a Latino physician in order to serve low-income families in Southern California, and we are led today by his son, Dr. J. Mario Molina, who is himself a physician. Given our roots as medical providers and executive leadership, we are especially disappointed to see outrageous statements implying we unfairly treat Latino physicians, or any physicians for that matter. We have and will continue partnering with our valued medical providers throughout the United States as we have done for more than three decades."